A new study suggests that small animals like birds and flies can observe movement on a finer timescale than larger creatures. Compared to us, many of these animals are able to perceive the world through a Matrix-like "bullet-time,” allowing them to escape larger predators. We know that animals sense the world in any number of ways depending on the species. Dogs, for example, have awful eyesight and low horizon line. So instead of depending on their vision, they perceive the world primarily through sounds and smells. In addition, animals have varying dynamic ranges when it comes to their senses; dogs can hear up to 40 kHz, dolphins up to 150 kHz, and bats up to an astounding 212 kHz. Much of this has to do with the various ways animals have adapted to their roles as predators and prey. Now it appears that there's a kind of dynamic range that exists in vision, as well — and it has to do with the rate at which the world can be perceived. As the new study published in Animal Behavior shows, small animals like insects and small birds can take in more information in one second than a larger animal, like us bulky humans. Indeed, all you need to do to get this impression is simply watch the way a small bird, like a budgie, twitches as it scans its surroundings. What looks like near-spasmodic behavior to us is an animal that’s essentially working at a faster “clock rate” (so to speak). To them, humans, or larger predators, appear to move in slow motion; we likely appear impossibly slow and cumbersome through those eyes. To measure this rate of visual perception, a team from Trinity College Dublin (TCD), Ireland, used a technique called critical flicker fusion frequency — a system that measures the speed at which the eye can process light. It works by measuring the lowest frequency of flashing at which a flickering light source is perceived as a constant. The team looked at more than 30 species, including rodents, eels, lizards, chickens, pigeons, dogs, cats and leatherback turtles. So, for instance, at the low end of the scale, deep sea isopods (or woodlice) could only see light turning off and on four times per second. At rates just slightly faster than that, these creatures perceive the light as being constantly on. 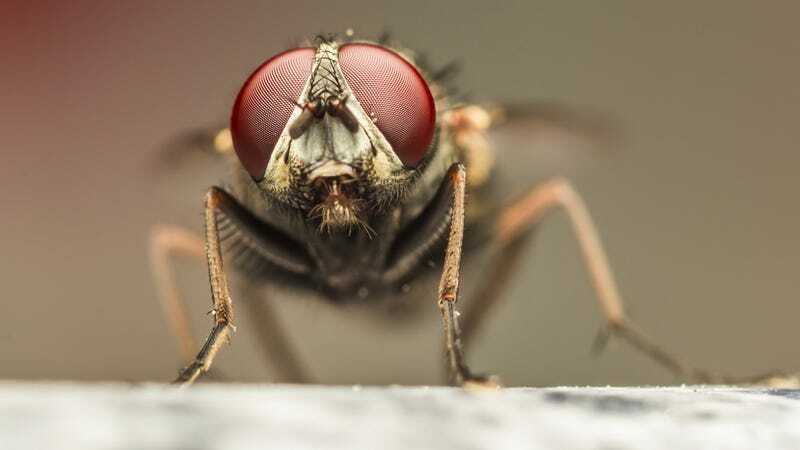 Flies, on the other hand, have eyes that react to stimulus more than four times quicker than the human eye. Compared to us, flies see the world in slow motion. Results from these tests on various animals were plotted on a graph, showing a strong relationship between metabolic rate and body size with the perception of temporal information. The ability of an animal to track a moving object depends on the time integral over which the individual can obtain its information. This is determined by its ability to "resolve," or process, temporal information. Credit: Andrew L. Jackson et al. So, the bigger the animal, the slower the temporal perception. The reason for this, say the scientists, is that there’s an evolutionary trade-off between other neural capacities and temporal perception. But it’s also an effect that works between humans; it may account for the way time seems to speed up as we get older — and why children always seem to be in a hurry. Interestingly, this is the first study to indicate a general trend in the ability of vertebrates to resolve temporal information.